Gutter Helmet has built a reputation for providing one of the most unique, advanced and effective gutter protection systems in the world. After more than 35 years in the business, our patented Gutter Helmet technology has been installed on millions of homes across America. No more climbing ladders to clean your gutters! No more water damage from overflowing clogged gutters! No more dead flowers and plants from landscape erosion! We wouldn’t have been able to stay in business this long if our gutter covers weren’t outstanding and meeting the gutter protection needs of our customers. However, don’t just take our word for it. Take a look at these video testimonials to learn about our customers’ experiences and see why Gutter Helmet is America’s #1 gutter cover! Watch as Designing Spaces, a Lifetime TV home improvement show, shows how a certified installer custom-fits Gutter Helmet on a home in Alabaster, AL. 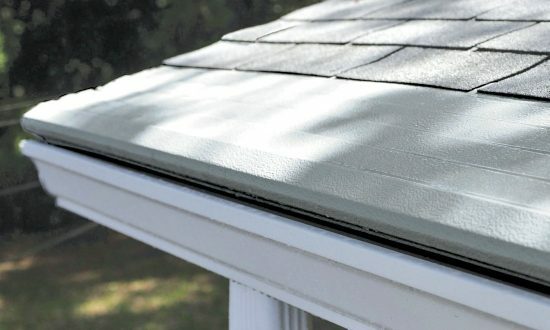 They highlight the many unique benefits of our patented gutter protection system and show exactly how Gutter Helmet works to save homeowners hour after hour of dealing with leaves, bugs, debris and muck. Watch as Dean and Miriam Johnson, the hosts of PBS’s long-running home improvement series Hometime, walk you through the Gutter Helmet installation process. They discuss the dangers of poorly functioning or failing gutters and offer a glimpse at how our patented gutter guard design works. Check out this video to find out just how the Gutter Helmet installation crew works to ensure total home protection. Well-known TV show and magazine This Old House gives expert advice on home improvement and answers a couple’s letter regarding problems with their gutter system. This Old House demonstrates the effectiveness of different methods of gutter protection, pointing the couple to the solution to ending the task of gutter cleaning and the need for climbing ladders.